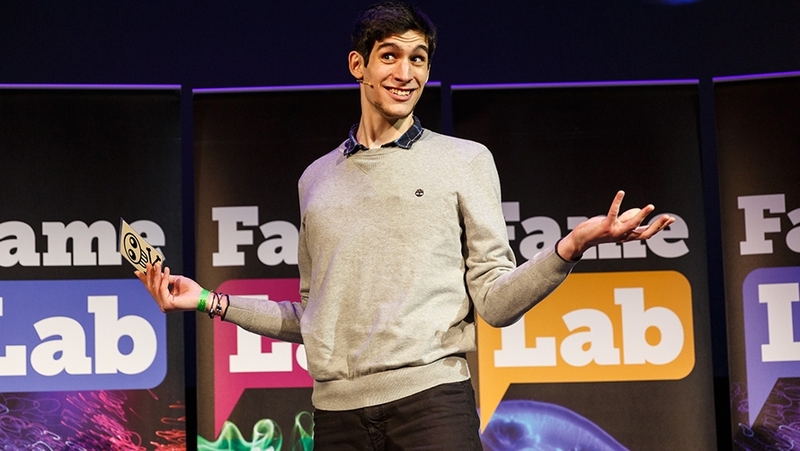 We asked Hans Pfalzgraf our 2018 FameLab UK runner-up to write a blog about his experience of participating in FameLab and what he learnt. Here’s what he had to say. Two years ago, I saw a link for a presentation competition called FameLab. Since I wanted to improve my presentation skills, I signed up as soon as possible (or, at least, before I could change my mind). I really liked the format: a talk so short that I have to cut out everything that is not essential and it lets me optimise every sentence. I was happy not having a PowerPoint: it forces the audience to look at me (instead of avoiding eye contact by pretending to read the slides). This means they pay attention to the body language I use to explain the scientific concepts. The idea of being assessed by judges can be a bit daunting, but they’re actually friendly and chatty, so it softens the stress of FameLab being a “competition”. Most of their feedback is about your strengths, which is both motivating and useful to know. You also learn a lot from other contestants, so that there is much to gain just from the heats stage. Believe it or not, you can already have a significant impact there! For example, in London, I actually bumped into a Pokemon Go player who said she had seen my talk, and never saw anyone as excited about proteins as I was. While I didn’t get further than regional finals in 2017, there was more to come. Fast forward to 2018 I was encouraged me to participate again. I was quite eager to apply everything I had learned throughout the previous year, from voice training to story-telling. So I signed up for FameLab Cambridge and was lucky enough to win the regional finals, which entitled me to a weekend masterclass. This masterclass is definitely one of the best parts of FameLab. You get to learn and practice with other budding science communicators in workshops that are run by a knowledgeable trainer. That year, Matthew Tosh (one of the FameLab trainers) taught us an inestimable amount about presenting and about being interviewed, and these skills keep on giving me an edge. For example, making the rights pauses while being filmed has gotten me loved by several video editors. But it’s also the other finalists who will teach you a lot and make it an unforgettable week-end. At the UK final, you’re given the opportunity to present in front of an audience that could be the largest you’ve ever faced. But it’s only a step up from the regional finals, so it is a nice incremental challenge that should make your subsequent presentations much less scary. The setting is much more professional; it trains you for big events. The great thing is that your talk is recorded, so you can reach a much bigger audience! My “success” got more coverage than I had ever received, which seemed to convince my supervisor that it was worth the time and effort (despite the wide-spread view that they should be spent on research instead).. I got a personal congratulations message from the Head of School, a news post from my PhD programme, the NRPDTP, and, furthermore, my participation in FameLab led to my faculty’s outreach officer offering me several jobs. I have since adapted my four FameLab talks for a very wide range of sci comm opportunities! In conclusion, FameLab was so enjoyable and useful for my personal and professional development, I can confidently say it was time well-spent!